Prime Minister Justin Trudeau and B.C. Premier John Horgan shake hands as LNG Canada CEO Andy Calitz, back right, watches during an LNG Canada news conference in Vancouver, Oct. 2, 2018. 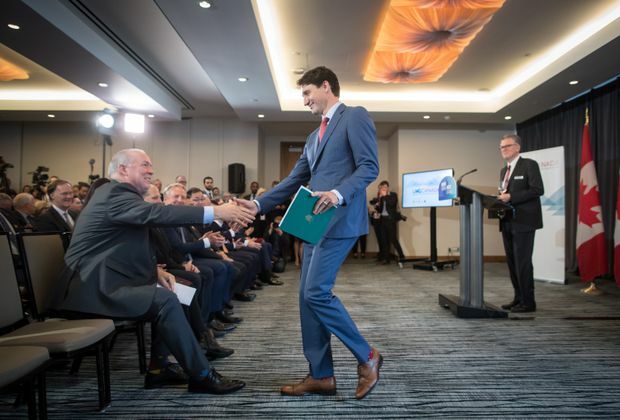 The decision by investors to move forward with the LNG Canada project in British Columbia means steeper reductions in greenhouse gas emissions will be required of the rest of the province, Premier John Horgan said Tuesday. But the precise climate footprint of the project remains in doubt and the B.C. government is openly questioning the emissions estimations put forward by the project’s proponent. Mr. Horgan’s government will release a new climate action plan later this fall that will count expected emissions from the LNG project of 3.4 megatonnes of GHG emissions annually. LNG Canada counts only the GHGs generated by the facility itself, which it says will total two megatonnes a year when the first phase of the project is complete. The provincial government is adding the emissions that will be produced in extracting natural gas from the ground, as well as the energy required to push that gas through the pipeline to the LNG facility. LNG Canada says it does not include emissions from outside the facility because it is not clear there will be an incremental increase in natural gas production. The B.C. government estimates that 40 per cent of the gas going to the project will come from existing production, and only counts the incremental increase in its figures. Both government and industry data only account for the first phase of the project, while environmentalists are counting the second planned phase, which has not yet been approved. Those figures are key because by the year 2030 B.C. is required by law to reduce the total GHGs for the province to below 38.8 megatonnes. Using the province’s figures, LNG Canada will account for almost 9 per cent of B.C. 's total allowable emissions. LNG Canada facility will undermine B.C.’s goals. Related: Co-owners give $40-billion LNG Canada project green light in B.C. Mr. Horgan said in an interview that the targets can still be achieved – but it will require reductions from industry, transportation and home heating. A new climate action plan will be released later this fall, but even that proposal will fall short of achieving the targets, senior government officials said Tuesday. Additional measures will be announced next spring to map out the path to 2030. A key feature of the strategy will be encouraging both consumers and industry to shift to electric power from fossil fuels. But environmentalists and climate scientists say both industry and B.C. are underestimating the real carbon footprint of LNG Canada. The Sierra Club of B.C. says “credible estimates" of emissions from the project range from 8.6 to 12 megatonnes, and at that rate, the project cannot fit into the province’s climate action plan. “It’s irresponsible to green-light a project" whose overall carbon production is "much larger than what industry and government report,” said Ian Bruce, David Suzuki Foundation science and policy director. Mr. Weaver’s three-member caucus will not support the project, but he has said he will look at the climate plan before deciding if he will follow through on an earlier threat to withdraw from the pact that the Greens signed to prop up the NDP minority government.